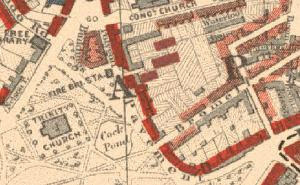 Charles Booth’s famous maps of London, made as part of his survey of Life and labour of the people of London (1886–1903), mince no word in their descriptions of the strata of London society. None of the neutral National Readership Survey system of A, B, C1 … E. Just a range from YELLOW: Upper-middle and Upper classes. Wealthy through RED: Middle class. Well-to-do and PURPLE: Mixed. Some comfortable, others poor to BLACK: Lowest class. Vicious, semi-criminal. What struck me was the dominance of the of the higher social classes, the middle class in particular, on the main thoroughfares, with the poorer sections of parishes often being relatively remote or tucked away. No hiding in gated communities for the rich then. Looking at the entries for my own home area, Clapham, I wasn’t surprised to see that the street I grew up on, lined with shops, was a bastion of the shop-keeping middle class, or that White Square (which even my parents’ generation remembered as a suspect area) was the only one which the Victorian police did not think was ‘wholly uninteresting’, prostitution on the Common having been reduced by the simple expedient of ‘cut[ting] down many of the bushes under which they used to carry on their trade’.